Chris Dugdale: Down to One. Thrilling new show for 2019. 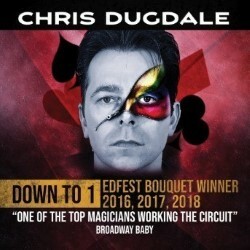 'One of the top magicians working the circuit' (BroadwayBaby.com). Only act ever to win the Edfest Bouquet three times (2016, 2017, 2018). 14 Royal Performances. 'The most unbelievable ending of any trick ever' (ITV). Down to One: a journey of magic and binary mind control culminating in one random audience member determining the success or failure of each individual show. 'There's no way a mere human can achieve what he does here!' ***** (BouquetsBrickbatsReviews.com). 'Mind-boggling... beyond belief!' **** (Herald).